When I saw Hershey’s Raspberry Hugs in with all of the other Valentine candy, I grabbed a few bags, knowing I was going to bake them into something. Ultimately, I decided to just chop them up and add them to my favorite chocolate chip cookie dough. The results were a delightful raspberry and cream flavored cookie with just a hint of chocolate. 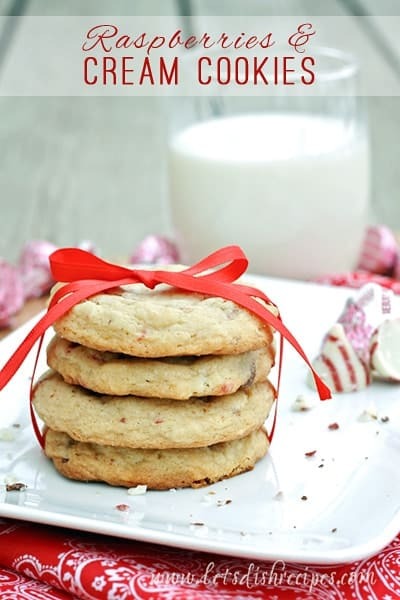 My husband says they taste like the raspberry cheesecake cookies at Subway, only way better! They’re perfect for Valentine’s Day, but I think I’m going to keep a stash of Raspberry Hugs in my freezer so I can make them year round. Cream together butter and sugars for 5 minutes with an electric mixer on high speed. Add eggs and vanilla and beat 3 minutes more. Stir in sour cream,followed by salt,soda and baking powder. Blend in flour,1 cup at a time. Stir in chopped Hershey 's Hugs. 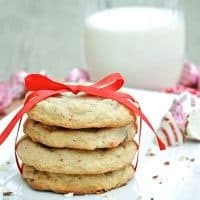 These are yummy looking cookies! Thanks Danelle.